My youngest sister brought her daughter, Kally (my oldest niece) for a visit recently. Kally loves to come visit me. Well, not really. She loves my chickens. And the rabbit. And the kids that live downstairs…but I still get to see her some anyway! With them, came a basket of goodies that my sis made for the trip. All sorts of homemade stuff (thankfully some of it made it all the way here so I got to try it) that tasted great and was healthier than the pre-made stuff you can buy at the store. And even better, Kally loved them all. Me, too. Preheat oven to 350 degrees. Butter a 8×12 baking dish and line it with parchment (BOTH are necessary, if you ever want to get it out of the pan again). If you leave some parchment to overlap above the rim of the pan, it makes it easier to pull it all out later. Toss the oats, almonds and coconut together on a cookie sheet and bake for 10-12 minutes to get them lightly browned. Stir occasionally. Dump them into a large mixing bowl and stir in the wheat germ. Mix butter, honey, brown sugar, vanilla and salt in small saucepan. Bring to a boil over medium heat. Cook and stir for 1 minute. Pour over the oat mixture. Add dried fruit and stir well. Pour mixture into prepared pan and lightly press evenly (it might help to wet your fingers to keep them from sticking). Bake for 20 minutes or so, until LIGHTLY golden. Be careful not to over cook (unless you like really hard granola bars instead of the more soft, chewy version). Cool for 2-3 hours before cutting (remember, I warned you about this part). 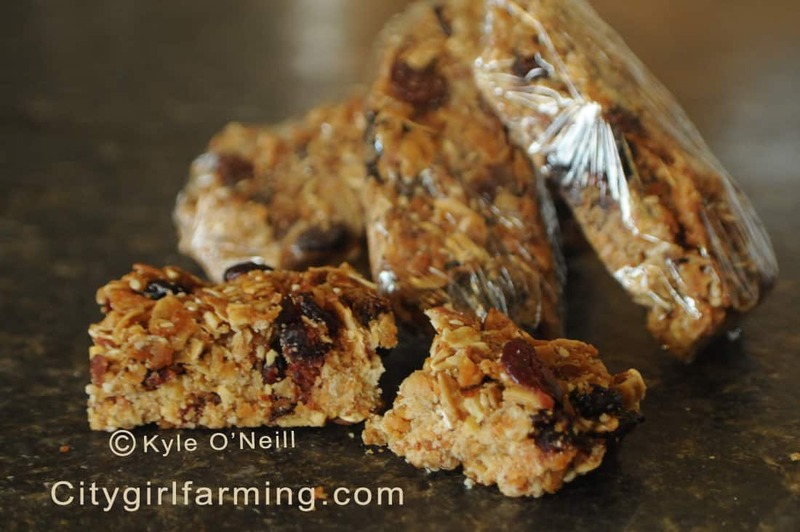 And feel cool about yourself as you pass out homemade granola bars. That is, if you feel like sharing them with anyone.